For nearly a decade, there hasn’t been more than a vestige of a black society in the official world of Dungeons & Dragons. There have been black people, but no black civilizations except for a relatively small group of survivors of a catastrophe and locals living under colonists’ control. Back in 2008, D&D’s traditional African-analogue tribal society hailed from a “savage,” disease-ridden jungle. It sunk into the ocean. That changed this year with D&D’s latest adventure, which now describes that society as a lively mercantile people based in that former colony. But the newly-released adventure has left me and other D&D players disappointed. This is a fantasy role-playing game—anyone can be anything—so why did the way D&D designed 5th edition’s first black culture feel so lazy? I’ve been exploring my reaction and that of other D&D players since I first read D&D’s latest adventure, Tomb of Annihilation, a month ago. I’d cracked open the 256-page tome eagerly, excited not only to study the maps, monsters and storylines laid out in its pages, but also to see what next steps D&D was taking to acknowledge the demographic breadth of its players in its tabletop fantasies. Flipping through Tomb of Annihilation, I found enchanting dungeons and gorgeous art and impressive puzzles and traps. I was also surprised to read about a black culture—5th edition’s first—that seemed to trade in dated stereotypes of African cultures. It wasn’t something that jumped out at me. It was a slow sinking-in—not outrage, but a series of questions spurred by what I saw, read, researched and talked about with other D&D players: Why did publisher Wizards of the Coast choose to resurrect their fraught pan-Africa campaign setting in 2017? Considering that the average D&D city is an amalgamation of European cultures, why is it rubbing me, and others, that Chult is an amalgamation of African cultures? What would it be like for me as a non-black Dungeon Master to replicate the “tongue clicks” of the black tribal cultures players encounter? Did any people of color work on this? And, most importantly—this is a fantasy role-playing game, so why didn’t D&D’s stewards at Wizards of the Coast exercise a little more creativity here? Inclusivity isn’t just a buzzword. When it comes to gaming, it’s shorthand for game-makers’ design decisions that accommodate everyone’s escapist fantasies. That means that anyone can be anything, unfettered from reality and the crude biases that have taken root here. Over the years, there has been a slow build of progressive values in D&D’s rulebooks. The thin, seductive and bare-breasted female monsters of D&D’s first few monster manuals have been phased out in favor of terrifying lady beasts. Since then, Wizards of the Coast has silently acknowledged its queer fanbase by adding a LGBT characters to Curse of Strahd, Storm King’s Thunder and, now, Tomb of Annihilation, in part at the behest of the game’s lead rules designer, Jeremy Crawford. The lead image for the human race in the current Player’s Handbook is a black woman. Tomb of Annihilation felt a little off in comparison. Its point of inspiration is a campaign setting that, for years, has been written off as tone-deaf. The new adventure draws on D&D co-creator Gary Gygax’s adventure Tomb of Horrors and combines that with source material detailing Chult, a jungle peninsula first conceived of in a 1992 novel called The Ring of Winter, in which an adventurer travels to Chult’s dinosaur-filled wilderness seeking the eponymous artifact. The Chult setting took more cues from a 1993 issue of Dragon Magazine’s “Warriors & Wizards from Afar” feature, the purpose of which was to flesh out or inspire homebrew D&D campaigns. The feature included the articles “Arms & Armor of Africa” and “The Dark Continent,” a template for “a generic Africa-like continent.” Its human inhabitants, described as “natives,” are dark-skinned with tightly curled hair, while its other races include pygmies and “bushmen.” In this setting, slaver caravans raid tribal villages, which survive on subsistence agriculture and hunting. A minutely-researched six pages detailing African weaponry followed, citing eight anthropological or historical texts. Set on this peninsula of Chult, 2017’s Tomb of Annihilation updates the 1993 campaign setting, cutting out several aspects that D&D lead designer Chris Perkins told me weren’t strong from a storytelling perspective. Gone are the foreign colonists who made Chultans second-class citizens in their own land and a strong emphasis on Chultans’ “warring, tribal” culture. Now, Mezro is absent in favor of the bustling, wealthy city of Port Nyanzaru, which was recently freed from foreign rule with the help of seven rich merchant princes. 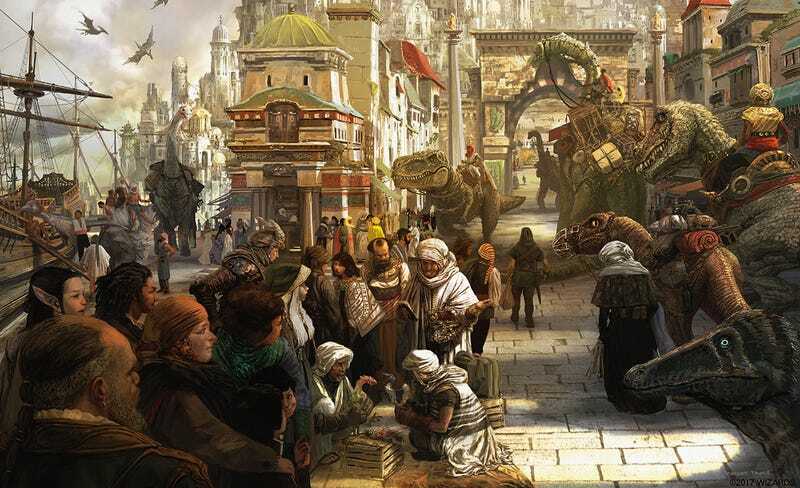 It is, the adventure reads, “a bastion of civilization and commerce in a savage land.” There, dinosaur races cut through the city streets which are lined by stone temples, warehouses storing ivory and jewels, markets and even a public bathhouse. Its culture is mercantile, rich in natural resources. Outside of the city is a dangerous jungle bustling with undead, reptilian beasts and tribal peoples. “Mad monkey feature” is a disease adventurers can pick up. Things have changed, but the thought processes that generated Chult version one are still there. Why has Chult changed over the last two decades? When I asked Perkins, he said that “We didn’t want to create a city that felt backward...It’s a tale of Chultans reclaiming their own city and land and redefining who they are and moving way from the idea of warring tribes to a more business-minded culture.” Perkins explained that the D&D team made a great effort not to depict the Chultans in a regressive way, but added that “The land that they live in is a savage land. That’s just part of what Chult is. It’s a place of monsters. It was our intention to show the Chultans have not only survived it, but have risen above it—that they have dispelled the warring tribal nature that previously defined them and are now actually thriving.” When I asked, Perkins said that no black writers or consultants worked on Tomb of Annihilation. Here’s the rub: While many players I talked to enjoyed how the history and political structures of Chult were expanded in Tomb of Annihilation (and enjoyed the adventure’s plot generally), they were still unimpressed by its execution. Its setting is an amalgamation of African cultures, a trope frequent in 20th century media that flattens the dimensionality of human experiences on the continent, which contains hundreds of ethnic groups. There are nods to West African voodoo, Southern African click-based Khoisan languages, East African attire (like Kenyan kofia hats) and the jungle climate of Central Africa. Its fantasy setting dissolves “Africa” into an all-in-one cultural stew that comes off as a little detached, sources I interviewed said. “I’m gonna ignore for a moment the fact that they described [Chult] as a wild, untamed land—how much of Africa was thought of for a long time,” Dace, who runs the Black Role-Players Organization, told me. He had bigger fish to fry: “Their speaking patterns are described right down to having clicks. This creates a problem if white gamers were wanting to do an accent and do serious clicks and clucks based on what they’ve seen on TV about African languages.” Dace noted that Africa has upwards of 2,000 languages and only three language groups use clicks. It is one of the most stereotyped aspects of Africa.” Dace suggested using Swahili as another point of inspiration. Light, the writer from BlackNerdProblems, told me that, “To me, it did not feel offensive. It felt lazy.” She wished that Wizards of the Coast innovated more instead of falling back on well-trodden tropes about what a unified “African” culture would look like. I wish D&D had made a black Atlantis. I’d be thrilled to crack open 2017’s official adventure and learn of the bleeding-edge technologist culture that architects magical machinery, who are black, or an ethnography of the cloud-dwelling black merchant princes who deliver their wares via airships. Every black D&D player I spoke with said they had some suggestions for Wizards of the Coast—and they knew lots of others who’d love to share their ideas, too. [Update—3:30 p.m. est]: An earlier version of this piece quoted a source saying that there are three languages in Africa that are click-based, when in fact, there are three language groups in Africa that are click-based. We have updated the piece accordingly.